Unilever Deal Update: Dove Hair Care for 24¢ & More! 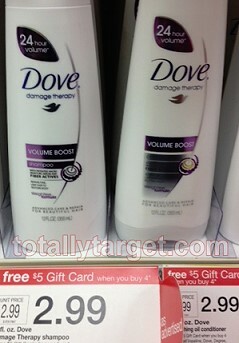 Woohoo for cheap Dove Hair Care! Looks like our 12 oz Dove Shampoos & Conditioners are included in the offer for a FREE $5 Gift Card wyb 4 Select Unilever products thru 8/18! = .96 cents for FOUR or .24 cents each after coupons and Gift Card! All Unilever coupons limit you to TWO identical coupons in one shopping trip- but this is very easy to work with since you can mix and match your products. There are TONS of different ways to do this deal but here’s some more deal ideas for you- some using a mix and match strategy because of our coupon wording. Some of the deals may vary depending on different coupon variations in different areas…. Not sure if it is still available, but there was a $1/2 target q for the suave lotion. Isn’t there a $1/2 Suave body lotion Target coupon? @Kristin & Melanie – there sure is! forgot all about it! got it added in TY! I did not get the Dove coupon in my RP insert today. Is it online? @Karen – the Dove coupon was in the 7-29 RP..hth! Can gift card deals be done more than once in one transaction? The dove products in my store did not have a tag so I didn’t dare to try since I was buying lots of stuff and didn’t want to miss it when it rang up and not get the $5 card. Are these items included at all stores? I had an issue today at Target and I wonder if anyone may have some insight on it. I had a coupon for every item I purchased and the cashier had no issues with it but then a manager walked by and asked her how many coupons did I give her and the cashier told her the amount, the manager than proceeded to look through my bagged items and counted, lifted up each item, verifying each coupon and telling me with each item that I was not allowed to make any returns because the amount of coupons I used. Now I do not plan on returning any of the items, but now I am concerned are we limited now?? Does this mean we have to make seperate purchases ‘”just incase” we need to return an item? And NONE of the coupons I had beeped, they all went through no problems. each one of my doves had the free trial hair spray. It was on the gold one and the blue one. I bought 4 dove shampoo and conditioners, 1 covergirl eye shadow, and 6 nail clippers for a total of $20.48, used qs on everything and a $3 on beauty purchase for a total of 5.42 out of pocket before the $5 gc from the dove. After that equals .42 for 11 items. SCORE! My store (West chester, OH) these were priced at 3.49 🙁 . Still a good deal but not 24c. @	Margarita : Anyway, the manager is wrong. You can return the items you purchased with coupons but on their policy, it just states that you will get your refund in a form of gift card. I think you should contact Target Corp and complain. First of all, Target’s business isn’t going so well… I do not think they want to lose their customers. Just take a look at how close their prices are comparing to Walmart: only 1 or 2 cents more. It used to be way more expensive when the economy was good. Ad that it is not right for the manager to just come in and take over another employee’s job and makes mean remarks to you. If the manager thinks that the cashier was wrong to take all the coupons, he/she could have waited until the cashier finished the transaction, take the cashier aside and “teach” the cashier. Anyway, this is a bad manager. So you can complain. This is the deal on the back of the ad correct? Do you know which st Ives products are included too? Hey Danielle- I saw body wash I want to say at $3.99. I believe there was lotion too- and I want to say around $3.79. Those were the only 2 things I notices and there are no St. Ives coupons as far as I know.